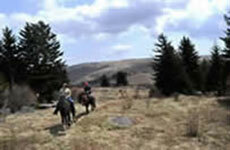 On The Windfall: NC Vacation Rental, NC Mountain Cabins, NC Mountain Rentals, Vacation Rentals NC. We are centrally located to many activities that include canoeing, tubing, bicycling, hiking, fishing, shopping, theater, and dining. Ashe County is home to many parks, including Mount Jefferson, the New River State Park, the NC game lands at Three Top Mountain, and Bluff Mountain Nature Preserve to name a few. It is a short drive to the Blue Ridge Parkway and the towns of West Jefferson’s “Arts District” and Jefferson. In less than an hour, you can drive to the Boone, Blowing Rock area, or take a scenic drive north to Abingdon, Va. to visit the historic Barter Theater. We are only 15 minutes south of Grayson Highlands State Park or the Virginia Creeper Trail (biking, hiking and horseback riding). The nearby New River offers canoeing and tubing. Well known restaurants, Shatley Springs and The River House are a short drive away. 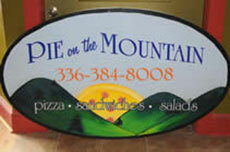 Pizza, Salads, Sandwiches, Gourmet Coffee, and Original Art Great fresh affordable food in a clean, eclectic atmosphere. Gourmet style pizza, salads, sandwiches, and amazing locally roasted coffee. Dine-in or take-out. Located in Lansing at the stop sign. 336-384-8008. Antiques on Main Over 23,000 square feet of unique antiques and collectibles! Come be transported back in time. Arts in West Jefferson Visit galleries, artists, and antique shops in downtown West Jefferson. Ashe County Cheese Carolina's oldest cheese plant, producing quality cheese since 1930. Located in West Jefferson. 8:30 am to 5:00 pm, Monday through Saturday. Ashe County Farmers Market Delicious, locally grown produce, nursery plants, jellies, baked goods, handmade crafts and much more! Demonstrations and contests held throughout the season. Saturdays, 8:00 am - 1:00 pm, from April - October. Boondocks Brewing Great Beer - Great Food - Great Service. We have a large and ever changing selection of craft beers on tap and in bottles with a strong focus on North Carolina crafted beers. We also have an affordable menu featuring casual-upscale high-quality items using fresh and locally grown ingredients prepared by our talented Chef and kitchen team. Florence Thomas Art School Offering instruction and exhibition in the fine arts, master and heritage crafts for both new and experienced artists as well as youth programs. Gallery of local artists and the late Florence Thomas. The Honey Hole The Honey Hole was established to provide encouragement and support to people who want to become involved in the fascinating and environmentally vital world of honey bees. We are a locally owned and operated shop dedicated to promoting the art of bee keeping by providing the finest quality supplies and products. We are in a heavenly location seated on Main Street in historic West Jefferson Great gifts too! The Hotel Tavern Restaurant & Bar offering salads, sandwiches, burgers, steak, seafood, pasta & more. Pet-friendly patio, outdoor seating & live music. Tuesday - Thursday: 11:30-9:00, Friday & Saturday: 11:30 - 10:00, Sunday Brunch: 11:00 - 2:00. Closed Monday. 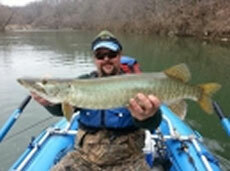 Fishing On The New River Rock On Charters, A full service fishing guide serving southwestern VA and the highlands of NC. A dedicated team of outdoorsmen who thrive on sharing knowledge, passion, and commitment to conservation. With only the finest equipment, our guides are at the top of their class and the top of their game. Rock On will pick you up at the Windfall, provide lunch and an unforgettable fishing adventure. Contact Josh or Ben at 540-354-9424 or 540-588-6628. Call Doug Cregger at 276-783-4136. Over 30 years of experience. The Virginia Creeper Trail is a 35-mile (56 km) multi-purpose rail trail in southwestern Virginia. The trail runs from Abingdon to Whitetop, near the North Carolina state line,through National Forest and crossing numerous restored trestles and crossing the Appalachian Trail. Whitetop Station is just 15 minutes from On The Windfall. is now an Audubon certified Forest Legacy Landbird Habitat.